424 Beacon is located on the north side of Beacon, between Gloucester and Hereford, with 422 Beacon to the east and 426 Beacon to the west. 424 Beacon was designed by Julius A. Schweinfurth, architect, and built in 1904-1905 by McNeil Brothers, carpenters, one of two contiguous houses (424-426 Beacon) built for Ralph Blake Williams and his sister, Ruth (Williams) Sears, the wife of Dr. George Gray Sears. Ralph Williams purchased the 54 foot lot for 424-426 Beacon on May 31, 1904, from Frank W. Crocker. It was part of a 113 foot 6 inch parcel running east from the corner of Beacon and Hereford that Frank Crocker had purchased on behalf of his employer, Edwin Carlton Swift, co-founder of the meat packing firm of Swift & Co., who had considered building a home on it. Frank Crocker purchased the land from Oliver Ames through three transactions on March 31, 1896, August 9, 1897, and June 30, 1898. Click here for an index to the deeds for 424 Beacon. The houses were completed by the 1905-1906 winter season. Ralph Williams and his mother moved to 424 Beacon, and George and Ruth Sears moved to 426 Beacon. Ralph Blake Williams as a real estate trustee. In September of 1906, Ralph Williams married Susan Jackson. 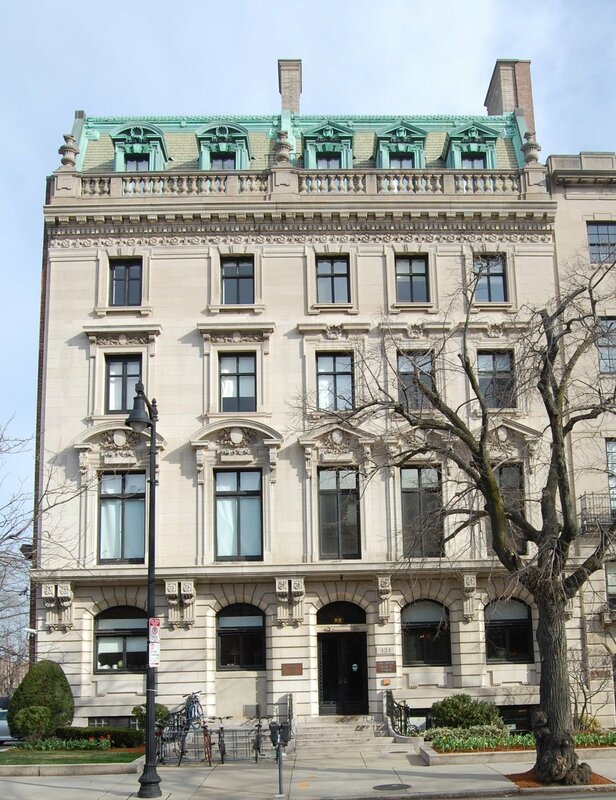 After their marriage, they lived at 31 Gloucester for several years, but by the 1908-1909 winter season, were living at 424 Beacon once again, with his mother. They also maintained a home in Dover, Massachusetts. 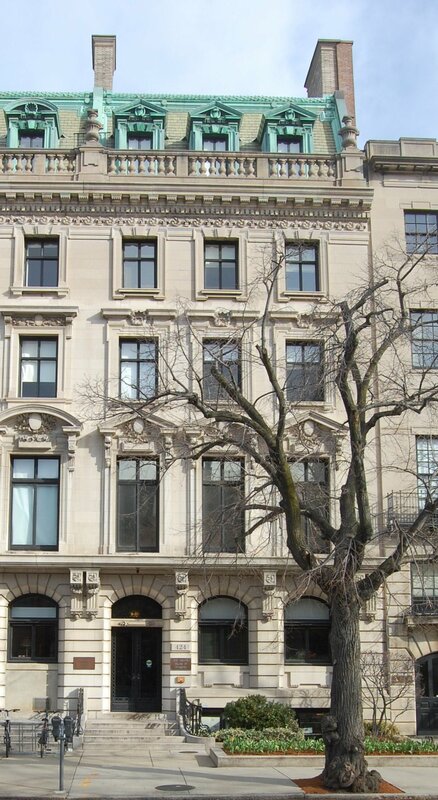 Ralph and Susan Williams continued to live at 424 Beacon during the 1915-1916 winter season, but moved thereafter to 356 Beacon. Alice Williams continued to live at 424 Beacon. 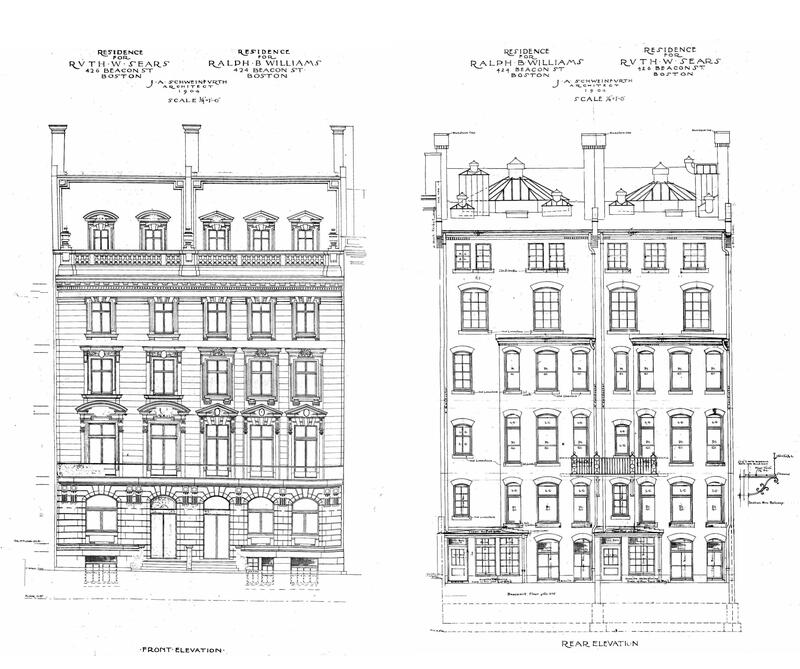 On October 24, 1916, Ralph Williams joined with the owners of 416-422 Beacon and 426 Beacon in an agreement to “impose a uniform restriction on their estates which will prevent the erection of any building or other structure in the rear of any of the said estates which will further materially obstruct the light, air and prospect now enjoyed.” The agreement specified that, prior to January 1, 1937, no building more than one story high could be built north of a line 92 feet north of the building line established by City of Boston for Beacon Street (the building line required a 20 foot setback from the north side of Beacon). In the early 1920s, Ralph and Susan Williams rejoined his mother at 424 Beacon. They had lived at 20 Hereford in 1920. Ralph Williams died in March of 1923. In his will, he left 424 Beacon to his wife. Susan Williams moved soon thereafter to 459 Beacon; Alice Williams continued to live at 424 Beacon until her death in February of 1926. On September 8, 1925, Susan Williams joined with the owners of 420-422 Beacon, 426 Beacon, and the vacant lot at 428 Beacon in an agreement to modify the 1916 restrictions on buildings in the rear of their properties, agreeing that no building more than one story high could be built north of a line 87 feet north of the building line established by City of Boston for Beacon Street (increasing by 5 feet the restricted area at the rear of the houses). The agreement specified that the right to erect and maintain one story stables in the rear of the houses remained in effect and that these structures could be used as garages for not more than two automobiles. Unlike the earlier agreement, no expiration date for the restrictions was set. The updated agreement may have been prompted by plans to build an apartment house on the vacant lot at 428 Beacon, on the northeast corner of Beacon and Hereford. 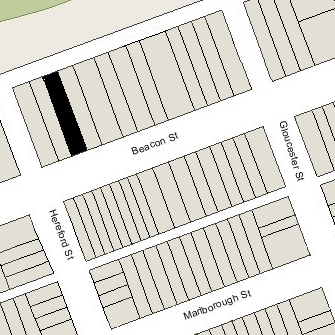 The agreement specified that the main entrance of any apartment building constructed at 428 Beacon would be on Hereford Street and that there would be no more than one apartment per floor except on the first floor, where two there could be two apartments. The apartment house was never built and 428 Beacon remained a vacant lot. On March 23, 1927, 424 Beacon was purchased from Susan Williams by real estate dealer Charles W. Rowell. The transaction was reported by the Boston Globe on April 3, 1927, with the purchasers indicated as Fred Holdsworth and Robert D. Farrington, real estate dealers in the same officer as Charles Rowell. On July 28, 1927, 424 Beacon was acquired from Charles Rowell by George A. Bell. He and his wife, Alice (Bailey) Bell, made it their home and operated it as a lodging house. George Bell had been a box manufacturer in Illinois and Missouri; he and his wife moved to Boston after he retired in the mid-1920s. George Bell died in May of 1937. On July 30, 1937, the Massachusetts Hospital Life Insurance Company foreclosed on its mortgage to George Bell and took possession of 424 Beacon. Alice Bell continued to live at 424 Beacon until about 1938. By 1939, 424 Beacon was the home of Mrs. Martha F. Poirier, who was the former wife of William J. Freund and used her maiden name. She operated it as a lodging house. In the mid-1930s, she had lived in Wakefield, where she operated the Wakefield Arms. Martha Poirier continued to live at 424 Beacon until about 1941, when she moved to 16 Keswick. 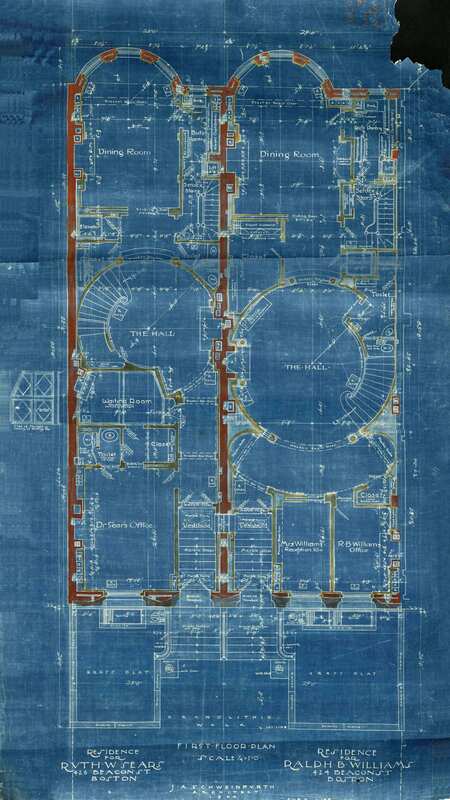 On May 29, 1941, 424 Beacon was purchased from Massachusetts Hospital Life by James A. Cassidy, and on May 31, 1941, he transferred the property to his step-father and mother, James Bernard Regan and Susan (Susanna) M. Cassidy Regan. James Cassidy was the son of Susan Cassidy and her first husband, John T. Cassidy, who had died in May of 1928. The Regans and James Cassidy lived at 424 Beacon and operated it as a lodging house. They all previously had lived at 30 Welles in Dorchester. James Regan owned “Regan’s Rooms,” a rooming house at 327 Tremont. 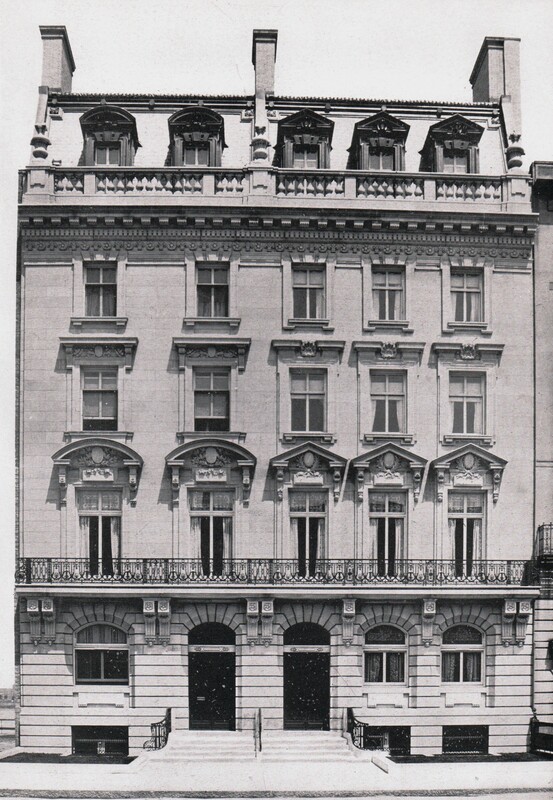 During World War I and the early 1920s, he had been a proprietor of the New Richwood Hotel at 254 Tremont (across from the Shubert Theatre) and then the Hotel Hollis at 247 Tremont. In August of 1943, the Regans purchased 422 Beacon. They sold it in December of 1944. In October of 1945, they purchased 426 Beacon. They sold it in June of 1950. On April 18, 1955, 424 Beacon was purchased from the Regans by George Irwin Rohrbough, president of the Chandler School for Women, located at 448 Beacon. He also owned the vacant lot at 428 Beacon. He and his wife, Martha Fraser (Waugh) Rohrbough, lived in Cambridge. 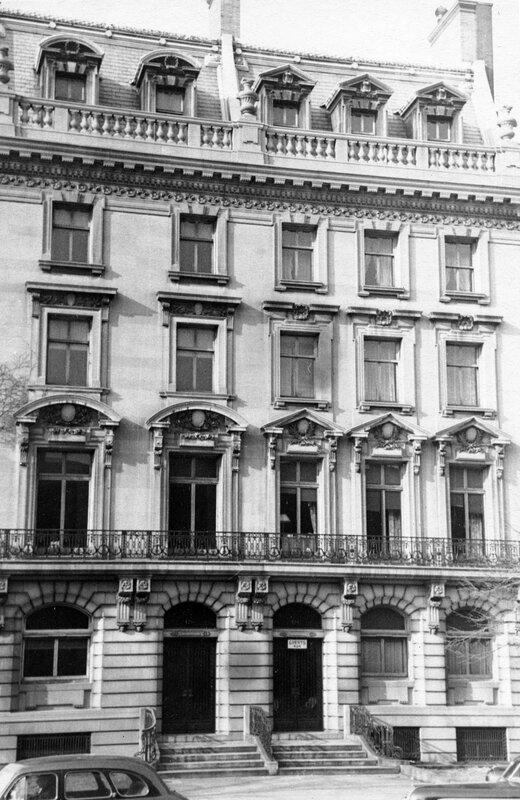 In July of 1956, he applied for (and subsequently received) permission to convert 424 Beacon from a lodging house into a school for use by the Chandler School. In July of 1959, George Rohrbough acquired 426 Beacon and in August of 1959, Chandler School applied for (and subsequently received) permission to cut doors in the party wall between 424 and 426 Beacon to facilitate the use of both buildings by the school. On August 10, 1971, the Massachusetts College of Optometry purchased 420–422-424-426 Beacon and the vacant lot at 428 Beacon from George Rohrbough and Rohrbough, Inc., successor to Chandler School. In May of 1971, George Rohrbough, as the seller under the purchase and sale agreement with the College, had applied for (and subsequently received) permission to convert 424 Beacon from a school into a college with a machine shop and accessory laboratories. Similar applications for 422 and 426 Beacon were submitted and subsequently approved. The College continued to use 420 Beacon as a library and to rent the apartments on the upper floors. consolidate 422 and 424 Beacon into one property, with the address of 424 Beacon. In August of 1997, it applied for (and subsequently received) permission to convert 418 Beacon and a separate former stable at the rear from a dormitory into classrooms and other college functions.